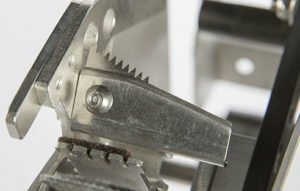 Traditional methods of cutting packaging tape on automated lines may actually produce weak points that could lead to tape break-outs and downtime. In many cases, the blade creates a series of peaks and valleys that may become vulnerable to splitting when subjected to external stress factors throughout the supply chain. 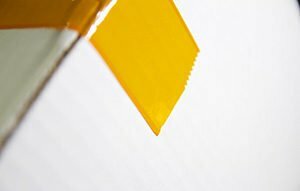 The cutting blade on PrimeLoc tape applicators is designed to minimize these potential failure points. The half-dull, half-serrated blade delivers clean, straight cuts that lower the risk of the tape splitting lengthwise. An additional benefit of having this type of safety blade is a reduced risk of injury due to cuts, especially during maintenance of the unit.The blade also has a self-cleaning feature, which prevents adhesive build-up. This extends the life of the blade, maintains precision cutting and minimizes maintenance to keep your lines running smoothly.